Every year, peasant movements around the world organize commemorative actions, such as marches, debates, reflection seminars, agricultural fairs, among others, as a symbol of solidarity and support for the fight against poverty. 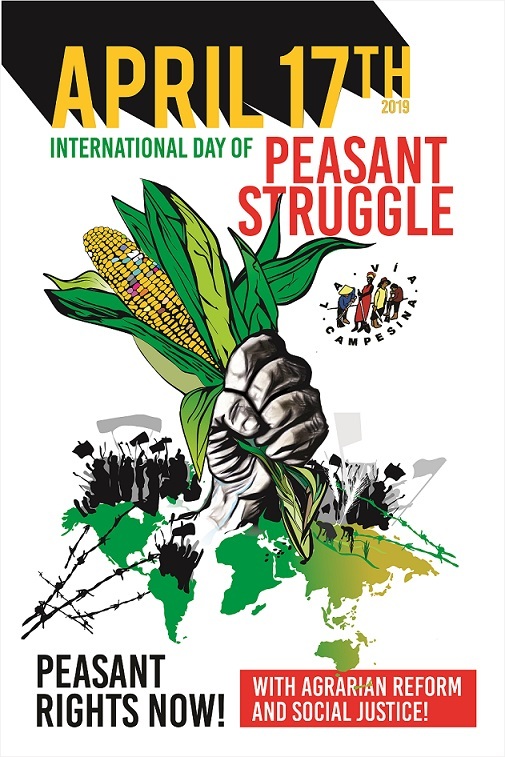 The 17th of April –International Day of Peasant Struggles is date was declared by La Via Campesina in commemoration of the struggles of peasant organizations around the world, in memory of the 19 peasants murdered in El Dorado dos Carajás, Brazil, in 1996, in the fight for the full right to land. This year, in the international context, the highlight of the commemorations of this of the recent adoption of the “United Nations Declaration on the Rights of Peasants and Other People Working in the Rural Areas“, in December 2018 through Resolution number A/C.3/73/L.30, as a universal tool of struggle to ensure a dignified life in the countryside. The declaration stresses and urges the central importance of ensuring access to land, water, seeds and other natural resources for peasants and others people who live in rural areas, considering that 70% of world production of food is guaranteed by peasants farmers and small scale food producers. On the other hand, at the domestic level, Mozambican peasant families will commemorate this date in a context of great pain and consternation due to the tragic effects caused by the passage of cyclone IDAI and major floods focus on the provinces of Sofala and partial floods in Tete, Zambezia Manica. These natural disasters directly affected 23,000 families, of which the majority were peasant farmers who have lost all their crops, food reserves and seeds, lowering the hopes of some production for their survival, not to mention the projected national results for the 2018 – 2019 agricultural season, which clearly will not be achieved. In the context of the commemorations of the international day of the peasant struggle, União Nacional de Camponeses (UNAC) recognizes and appeals for the continuity of the wave of national and international solidarity in favour of the victims affected by the natural disasters that devastated the central zone of the country, so that in the peasant spirit moved by the value of solidarity that identifies us, support is mobilized in favour of peasant families. As a representative and defender of the Mozambican peasant class, this is an opportunity to reiterate that the public policies and programs of the agrarian sector, should take into account the local knowledge and secular experiences accumulated by peasants, in working with the land. We reaffirm that Food Sovereignty and Peasant Agroecology should be considered as important guiding models their its design and implementation, these models have been proven to be the only true, viable, sustainable, and environmentally friendly practices to increasing food production, and guaranteeing the basic human right to adequate food. We reaffirm our struggle for the conclusion of the genuinely Mozambican Agrarian Reform that began with the land reform in 1975 and was reaffirmed in 1997 by the new Land Law, which should continue with the creation of conditions to develop peasant family agriculture and the rural environment through the dynamization of rural infrastructure, technical assistance to peasants, facilitation of subsidized credit to the family sector, rehabilitation of irrigation systems, facilitation of agro-processing systems and local preservation of products, and access to markets at fair prices. Let’s make this April 17th as the true Day of the Struggle for Peasants’ Rights, committed to a development really based on people, a Sustainable and Inclusive development, a Responsible development, a development based on real social and economic justice, where the peasants are at the centre and control the process. We, Mozambican peasant families maintain our commitment and firmness in the production of food to feed our people, regardless of any bad weather that wants to cross our path. Let us march, let us sing, let us show solidarity, let us reflect in a true environment of celebration and joy. Let’s Globalise the Struggle, let’s Globalise Hope! United Peasants, We Will Always Win!